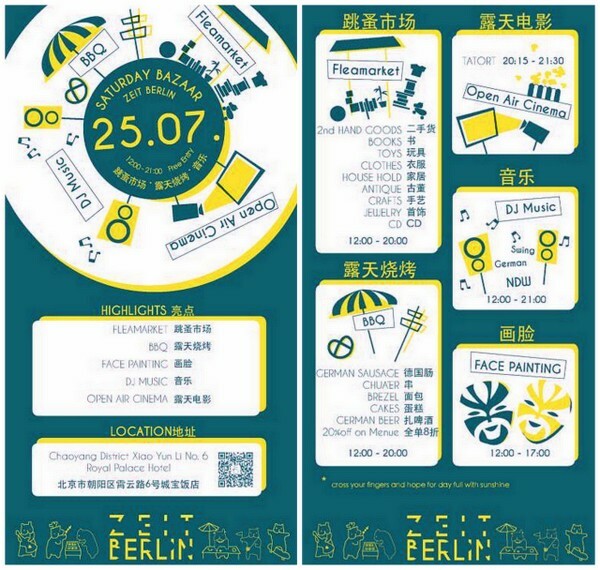 Zeit Berlin will host a Saturday Bazaar on July 25 that looks like it will be a lot of fun. I don’t visit this sprawling German venue, with its dining areas and multiple bars and pool table and private rooms and more, very often simply because I spend most of my time in the Workers Stadium area. But whether enjoying a huge lunch with former Home Plate host Seth Grossman just before he left Beijing or simply grabbing a few German brews while watching sports, I’ve enjoyed my time there. The bazaar is from noon to 9 PM, entry is free, and there will be a flea market, face painting, sausages, chuanr, pretzels, beer and a DJ, with ‘open-air theater‘ a bit later. Hopefully, there are some nice German wines, too, since they are highly underrated here in China. You can find Zeit Berlin in the Royal Palace Hotel just off Xiaoyun Road, not all that far from the original Home Plate and the newest Palms LA. Check this site for more details. The address is 城堡饭馆 — 三元桥霄云里南街6号 and the phone number is 6461-8842 .